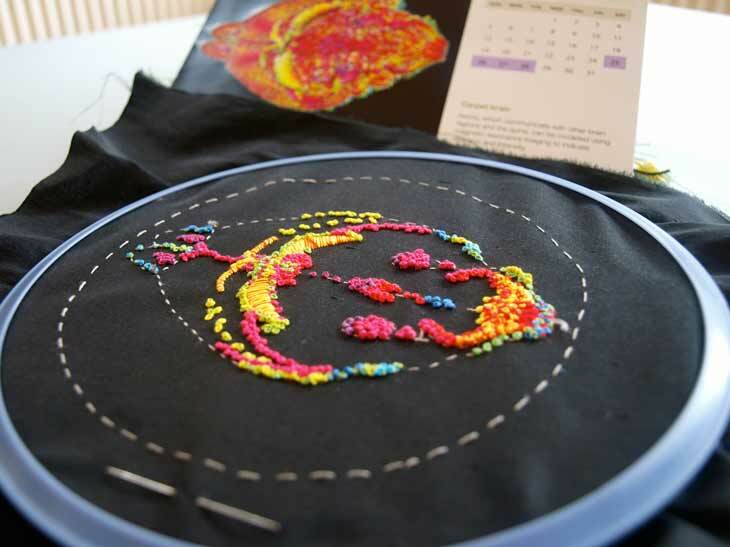 This is the first day's work on my mouse brain embroidery based on the December 2010 image from the Queensland Brain Institute's calendar. I'm working the French knots in different sizes: some with four, three or two strands of cotton and with varying numbers of wraps from two to five. The larger structures were stitched first in padded satin stitch. Next, I started laying down the main lines and blocks of French knots. Some of the knots are worked in a single colour, but I'm finding that mixing strands of two colours is producing a variegated look that matches the colours of the original image more closely.